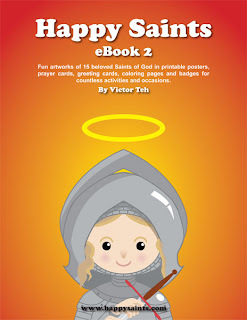 Happy Saints: Happy Saints eBook 2 now available! Happy Saints eBook 2 now available! I am happy to announce that Happy Saints eBook 2 is now available for purchase and downloading! Happy Saints eBooks feature fun artworks of beloved Saints of God in printable posters, prayer cards, greeting cards, coloring pages and badges for countless activities and occasions! You can view samples and purchase both eBooks here for only USD$14.90 each! 2nd Happy Saints Ebook on its way!